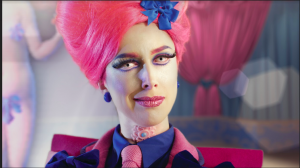 Hot on the heels of last year’s ‘Spite Your Face’ which was selected for the Venice Biennale, digital artist Rachel Maclean’s first feature film ‘Make Me Up’ takes her out of the gallery and into the cinema with this month’s premiere at the BFI London Film Festival followed by a theatrical run and a national broadcast on BBC 4. This feature-length feminist science fiction film was produced to celebrate 100 years since The Representation of the People Act 1918 which widened the vote to all women over 30 (as long as they met the minimum property qualifications). The film is set in a fluffy hyperreal world from the future which could only come straight from the artists’ mind however it doesn’t take long for things to take a sinister, and all too real, turn as we discover the regime that the female group of hyper cute inhabitants are forced to endure. They compete for survival by completing a series of demeaning tasks, inflicted upon them by authoritarian demigod The Figurehead (played by Rachel). The Figurehead enforces the ideals which the women must follow while being judged by some not so futuristic technology. The technique of cinéma verité is used to bring the characters to life, using the BBC’s sound archives to speak for the characters as their dialogue. The Figurehead is voiced almost entirely by Kenneth Clarks 1960’s visual essay ‘Civilisation’. This voice from the past serves as a reminder not only that history repeats itself, but that the dated views and language also form the foundations of the world we live in today, suggesting there is always more work to be done as alluded to with the MeToo movement. When they find their voices, the strong female characters views are composed of speeches and interviews from more contemporary figures, including amongst others; Germaine Greer, Rose McGowan, Geri Halliwell, Miley Cyrus, Nicki Minaj, Taylor Swift and Katy Perry (who is a self-confessed fan of Rachel’s work). This ingenious technique as it’s used, which for me is the star of the show, is a trademark of Rachel’s work. It’s used at times to skilfully subvert the original context and meaning of the speeches and other times they amplify their original message. The role that technology plays in the film mirrors this duplicity; is it a force for good creating spaces for self-expression and for people to explore identity or is technology our master which encourages unrealistic ideals with our self-worth only measured in likes and follows. With young people now at the greatest risk of depression caused by loneliness, it’s a point that really hit home. I’m not sure I can live without my smart phone and at least some social media, but would I be happier if I did? The film has stayed with me while I wrestle with the ideas and points it raised which is always welcome. The depth to the work and political themes explored by this allegory make Rachel stand out as a modern-day digital George Orwell. I’m delighted that this work of beauty, that will be at home as a part of exhibitions in a gallery space, but I believe best seen on the large screen, will be available to a wider audience. ‘Make Me Up’ Cinematic run from the 12th – 30th October followed by a BBC 4 transmission in November.